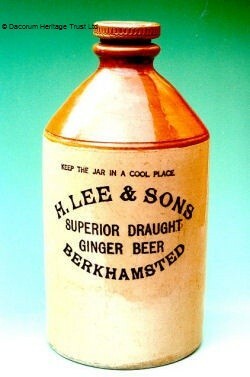 H Lee and Sons | The Dacorum Heritage Trust Ltd.
H. Lee and Sons was a mineral water supplier, that also made dry ginger ale, cordials and ginger wine in the late 1880s and early 1900s. Henry Lee born 1855 in Potten End brought a well-established mineral water business and then purchased and converted stables in the Berkhamsted High Street. The building that was the offices still stands on the corner of Three Close Lane, just off Berkhamsted High Street. In 1903 he built a new factory, which was equipped with the latest equipment. Retiring in 1907 he passed the company to two of his sons Harvey and Frederick Harold. Dacorum Heritage Trust have a large number of bottles with the ‘H. Lee and Sons Berkhamsted’ imprinted in to them.